Not to be confused with Mario's FUNdamentals. Mario Teaches Typing is a licensed edutainment game developed and published by Interplay Productions. It is one of the few licensed Mario computer titles. Mario Teaches Typing was originally released for MS-DOS in 1992, where the user could either use two 3'5" floppies or a single 5'75" one. It was later released on CD-ROM for Microsoft Windows and Macintosh in 1994. 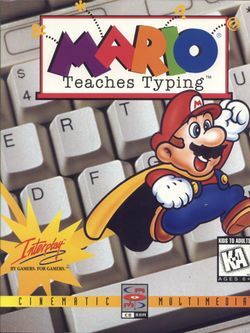 As the title suggests, Mario Teaches Typing was designed for improving a computer user's typing skills. 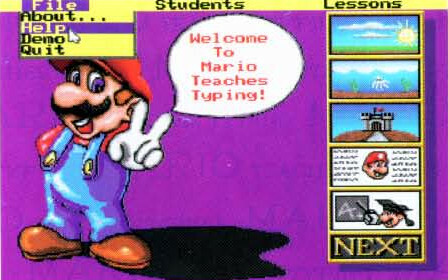 Mario Teaches Typing eventually spawned a sequel in 1996, Mario Teaches Typing 2. All of the game's music was sampled from Super Mario World. The MS-DOS version is the very first Mario game where Mario speaks. In that version, he was voiced by Ronald B. Ruben. He is replaced by the iconic floating Mario head in the CD-ROM version. In this version, he is voiced by Charles Martinet, who has since remained Mario's voice actor. Most of the gameplay involves the player typing in a sequence of keys in correspondence to what the computer screen displays. When the game starts, the player is taken to a main menu. There are three dropdown menus, "File", "Student", and "Lesson". The File menu has four main options, including the option to activate or deactivate sound effects and music: About, Help, Demo, and Quit. The first mode provides a single screen of the in-game credits, the second mode is essentially a summarized version of the manual, the third mode shows a gameplay demo for each mode. The last option is self-explanatory: it allows the player to exit the game (which is also doable with the 'q' key). The player can create a new profile from the "New" option of the "Student" dropdown menu. Here, they must enter their name, select a playable character (otherwise known as their "teacher" from the report card): Mario, Luigi, or Princess Peach. However, none of the characters have unique abilities. Each profile has a "GOAL WPM" parameter, which is five by default. The player can change the value to a different number, which is necessary to unlock some later modes. By default, these modes are inaccessible if the user does not log on to their profile. The "Student" menu also has the "Load" option for entering a student profile, the "Edit" option for editing their profile information, the "Lesson Times", which show the length of each lesson, and lastly "Certificates", which displays their certificate if they have earned one. The player can earn a certificate by completing every challenge; it displays the message "Congratulations!" with an ASCII art of Mario and the mode they most recently completed. The third menu, "Lessons", has six options, all of which alter the keys that appear during gameplay. This especially occurs in the first mode, Outdoor World. The options include: "Home Row Only", "Add Top Row", "Add Bottom Row", "Add Numbers", "Add Symbols", and "All Keyboard". The latter most option adds the largest variety of keys during gameplay. The main menu has five playable modes, each represented by an icon on the right side. To access a mode, the player can either click on the icon or type in the corresponding number displayed on it. The second and third mode are only playable if the player either has a high WPM goal or reaches it. The fifth mode simply provides information of the player's in-game performance. The first four modes have a dashboard on the bottom screen (except the fourth mode, Practice, which displays it on the top). It calculates the time, average WPM, incorrectly pressed keys, and the total of keys typed. The information on the fifth option's report card is based on the player's most recent performance per mode. In the first three modes, the player's character (Mario, Luigi, or Peach) cannot advance unless they hit the correct key. Each mode has a time limit which, when reached, redirects the user to a screen displaying their results. 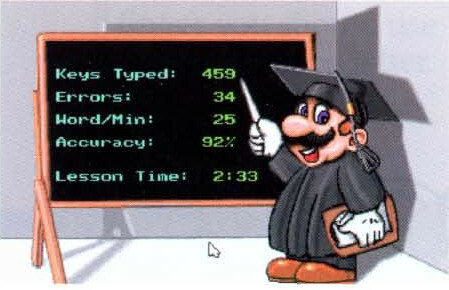 The screen shows Mario in a scholar outfit pointing a stick to the results on the chalkboard. A story was added into the CD-ROM release, which is missing from the original MS-DOS version. It is even shown from various animated cutscenes. Before Mario can go on any further, the Magical Typewriter explodes. In place of the typewriter is a scroll, which is also floating in the air. Mario takes the typewriter and sees a picture of three pieces of the Magical Typewriter and the words, "FIND ME..." Mario and Luigi decide to recover all of the pieces and improve Mario's typing skills. As Mario stomps a Koopa Troopa, a Mushroom falls from the sky, then poofs into the first piece of the typewriter, which is added into the scroll. Mario and Luigi then walk up to the bridge over the river, only to find that there's a large gap in the middle of the bridge. As the brothers watch Cheep Cheeps leap from the river, Mario shrugs his shoulders and dives into the river, only to end up being chased by the Cheep Cheeps. Luigi eventually jumps on the Cheep Cheeps and dives in after Mario. Mario and Luigi get chased by a larger group of Cheep Cheeps, disturbing a snoozing octopus. The octopus swims up and captures the Cheep Cheeps, saving Mario and Luigi. Mario and Luigi emerge at the other side of the bridge, and the octopus gives them the scroll, which now has the second typewriter piece. A giant green ! Block suddenly falls from the sky and destroys Bowser's Castle. Some changes were made to the CD-ROM version, mostly to accommodate its larger storage size. One of the changes includes cutscenes, which shows a story where Mario and Luigi go on an adventure to recover the pieces of the Magical Typewriter. The floating Mario head replaces a static background Mario in parts of the game. From the main menu, the player can rewatch clips of the Mario head by either pressing "I" or selecting "M.I.R.T" from the "File" menu. A rap song was added in the CD-ROM release, "Practice Makes Perfect", and the user can listen to it on the main menu, by selecting "Rap" under "File", or by entering the 'r' shortcut key. Practice Makes Perfect is stored on an audio CD portion of the disc, meaning that it can be played from audio CD players. 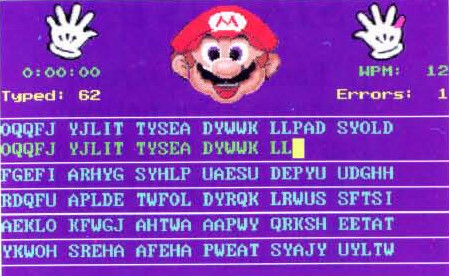 The manual for Mario's Teaches Typing is based on an earlier version of the game, as shown from the manual screenshots. On page 6, it is said that the player cannot change their nickname, although this is doable in-game. On page 7, the main menu screen does not organize the modes by number. On page 15, the layout of Expert Express is different: the two icons of Mario's hands are at the top of the screen, the letters on-screen were displayed in a different font, and the paper background is missing. Additionally, the Mario head had different eyes, including larger sclera and a purple eye color. On page 18, the results screen is a little different. The blue boxes reading "Next" and "Menu" are absent, and the chalkboard text is spaced slightly differently. The user creates a new profile. Mario collects Coins in the clouds in the first mode, Outdoor World. Mario (in a scholar outfit) shows the player's results on a chalkboard. The About menu, which displays the game credits. The Help menu, which summarizes the information on the game manual. Although Toad appears on the title screen, he is not shown elsewhere in-game. This page was last edited on March 31, 2019, at 11:56.